Your Source for Application Assessment Test Answers, Solutions, Questions, Samples, and Tips. You are about to take a Pre-Employment Assessment. Your assessment results will determine your eligibility to be considered for a position with Wal-Mart Stores, Inc. for the next 60-days. The test you are about to take has 65 questions and takes approximately 40 minutes to complete. If you are a person with a disability and need an accommodation, please see any member of management for assistance. In order to be considered for a position you must complete and pass this assessment. Please be sure the work you submit is your own. Do not seek or accept help in answering the questions on the assessment. 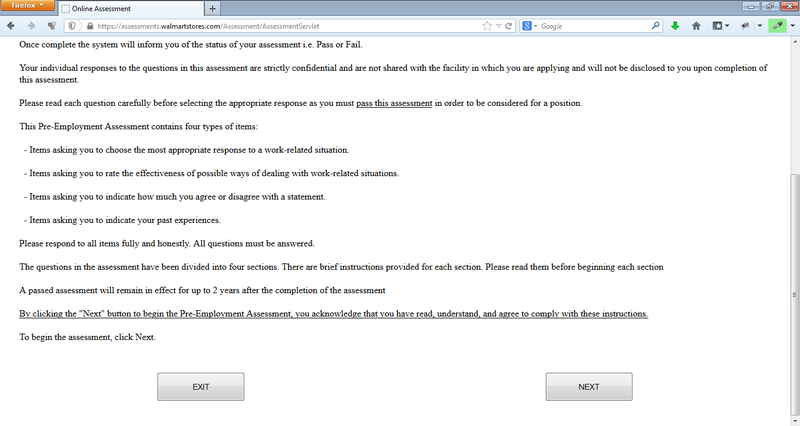 If you must leave the assessment before completing it, please click the "Exit" button at the bottom right hand corner of the screen. The system will save your answers. When you resume the assessment, the system will return to the point at which the previous session was interrupted. Once complete the system will inform you of the status of your assessment i.e. Pass or Fail. Your individual responses to the questions in this assessment are strictly confidential and are not shared with the facility in which you are applying and will not be disclosed to you upon completion of this assessment. Please read each question carefully before selecting the appropriate response as you must pass this assessment in order to be considered for a position. - Items asking you to choose the most appropriate response to a work-related situation. - Items asking you to rate the effectiveness of possible ways of dealing with work-related situations. - Items asking you to indicate how much you agree or disagree with a statement. - Items asking you to indicate your past experiences. Please respond to all items fully and honestly. All questions must be answered. The questions in the assessment have been divided into four sections. There are brief instructions provided for each section. Please read them before beginning each section. A passed assessment will remain in effect for up to 2 years after the completion of the assessment. 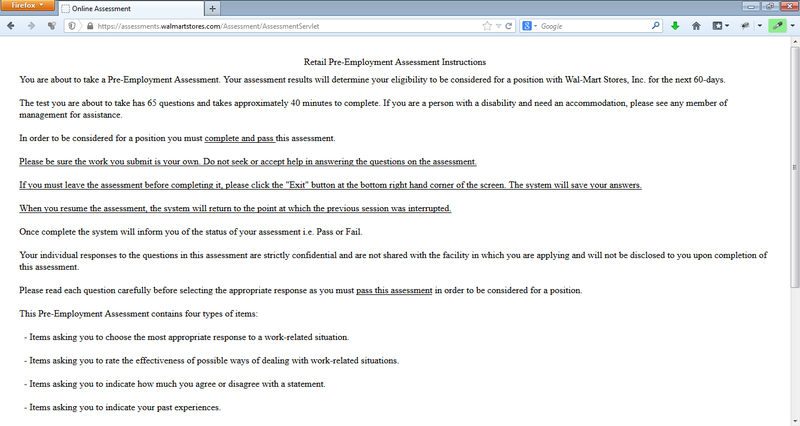 By clicking the "Next" button to begin the Pre-Employment Assessment, you acknowledge that you have read, understand, and agree to comply with these instructions. To begin the assessment, click Next. How were you evaluated by your supervisor in your current or most recent job? I often lose my patience with others. How would others rate your ability to handle last minute changes? How often did you complete extra credit assignments when they were offered in school? In the past year, how many times were you late for work (or class)? I dislike having several things to do on the same day. During the middle of a shift, you notice that your coworker, Jim, looks really upset. What action would you take? How do you typically handle stress on the job (or in school)? While you are on break, a customer spills a large drink in a busy area of the restaurant. Cleaning the floors is the job of another team member, but he is taking a customer's order. What would you do? I am sometimes unkind to others. People say I am a very reliable person. I consistently focus a high level of energy on my work. If you do not get this job, how easy will it be for you to get another one? A customer asks you a question and you are not sure of the answer. You feel the customer expects you to know the answer. What would you be MOST likely to do? Suppose we contacted your most recent supervisors (or teachers). How would they describe your dependability? People say I am the best worker they have ever seen. While you are working, you overhear a pair of coworkers on break. The two are talking about another team member because she works too slowly. What would you be MOST likely to do? Compared to your peers, how often do you lead others? How long have you worked in your current or most recent job? In school, how frequently per year did you request an extension on a due date from a teacher? How do you respond to a new team member? In high school, how many classes did you fail? People say I can be counted on to do whatever it takes to get the job done. How often do people come to you for advice or suggestions? How often do other people come to you with their problems? How would you describe your grades in high school? Suppose we contacted your most recent supervisors (or teachers). How would they most likely describe the speed with which you complete your assignments? In school, how many of your teachers didn't like you or gave you a difficult time? I would prefer a job in which . . .
People say I always do things correctly and accurately. Suppose we contacted your most recent supervisors (or teachers). What would they say about how often you stretch the rules at work (or in school) to get things done? I always pay attention to every detail. If asked, my most recent managers (or teachers) would say that I can work longer and harder than most of my coworkers (or classmates). Disclaimer. Simple theme. Powered by Blogger.